UCF opened its 2018 season with a 56-17 victory at UConn on Thursday night, which allowed them to move from No. 21 to No. 19 in this week’s AP Poll. 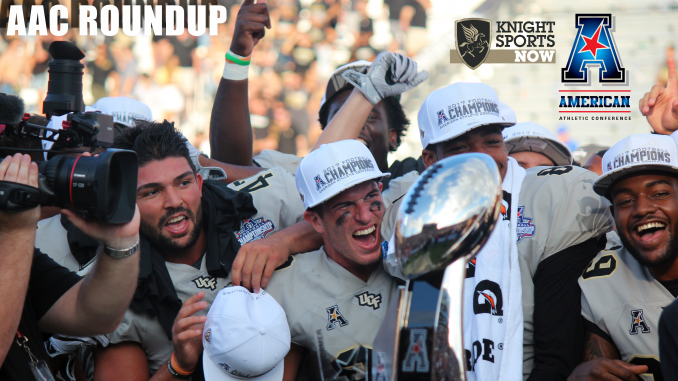 The Knights (1-0, 1-0 AAC) have now won 14 straight games, which is the nation’s longest active winning streak. They host South Carolina State next Saturday, but before we get there, what else went down around the AAC in week one? The Knights’ strength of schedule took a hard hit in week one. Of their eight conference opponents, only three started off the year with a win. Two of those were easy throwaway games, while Cincinnati’s was actually legitimate. UCF is the clear favorite to win the AAC East, but the rest of its division and conference losing winnable games won’t help with national perception. Of course, Josh Heupel and his team can’t control anything that goes on around the AAC. They just have to keep winning. After one weekend, South Florida and Cincinnati look like the only two threats in UCF’s division. That could change, but that’s where it stands right now. Temple could bounce back, but there isn’t much going on to suggest that ECU and UConn will recover any time soon. In the AAC West, Memphis continues to be the favorite. Houston avoided a letdown, but wasn’t overly impressive in its win. Navy didn’t look like much of a threat and the others are even further behind. Overreactions often run rampant in week one, but it’s fair to say that opening weekend in the AAC wasn’t pretty.